Washington, D.C. — This week, on Oct. 3, every single cellphone in the United States will receive a text message from president Donald Trump and there is no way to stop it. While it likely won’t be the case for future alerts, Wednesday’s test text message will not have anything to do with politics. Instead, it is a nationwide test of a new system called a “presidential alert” which was recently created and will be implemented by the Federal Emergency Management Agency (FEMA). The government claims the new FEMA system will only be used in case of a crisis which affects the entire nation—like an imminent nuclear attack. As we’ve yet to have a crisis which has effected every single town in every single state simultaneously—even on 9/11—the justification behind this measure seems sparse at best. According to FEMA, the test will happen at 2:18 PM EDT and all cell phones will have a message box popup, accompanied by a tone and a vibration. They claim that it is not a text and your phone number will not be shared with anyone. Unlike alerts from local governments across the country, you cannot opt out of this one. Trump and all future presidents will now have a direct and one way line of communication with every single American from here on out. Wireless phone users have the ability to opt out of most alerts sent under the Integrated Public Alert and Warning System, run by the Federal Emergency Management Agency. While some users can choose not to receive regional messages and so-called Amber Alerts regarding missing or endangered children, under federal rules, receipt of the top-level “presidential alerts“ is mandatory, according to a report in Politico. All radio and televisions will also receive a simultaneous warning which will interrupt regular programming and last for about two minutes. 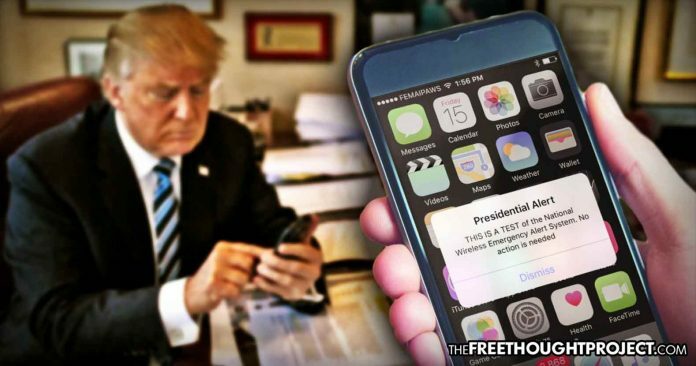 While many may think the idea of the president having access to a one-way push notification to all Americans may be a rather benign act, others disagree. Just ask those in Hawaii how they felt when they were sent a message claiming that a nuclear attack was imminent. Parents were witnessed lowering children into sewage drains and fighting to remove manhole covers. Citizens were seen leaving their cars in traffic and running to find shelter nearby. It was chaos and madness on a massive scale and it only went to one state. For this reason and many others, people are speaking out about this system. According to Politico, three New Yorkers are suing in federal court to try to halt Wednesday’s test. Those on the left are utterly horrified at the idea of their “Not My President” forcing them to read his tweets. But, like all spectacular acts of tyranny, this system was setup bipartisanly. To those who think this is Trump’s doing, think again. This program was forged by the Barack Obama administration by a Republican and signed into law in 2016 by the president. While the above description may seem harmless enough, the plaintiffs think that this law leaves a lot of room for abuse, and they are right. “Without more specific definitions…officials — including President Trump — are free to define ‘act of terrorism’ and ‘threat to public safety’ as they see fit, potentially broadcasting arbitrary, biased, irrational and/or content-based messages to hundreds of millions of people,” the complaint claims. Indeed, peaceful anti-government protest could one day be deemed a “threat to national security,” and a push sent. No longer would it take mainstream media days or weeks to demonize a person or a cause, this could now happen in minutes with the abuse of this system. To get a glimpse of this police state reality one need only imagine a system like the Amber Alert but that goes out to everyone and tracks alleged dissidents. Innocent political rivals could be deemed criminals instantly and they would have no place to hide. While this may seem extreme, remember that all government programs, such as the PATRIOT Act start out being presented as a means to protect national security interests but end up being used to spy on, propagandize, and deprive innocent Americans of their liberty. We are now witnessing this process play out in the very pockets of our pants.